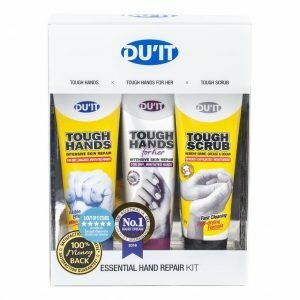 DU’IT Tough Hands is a scientifically proven, intensive strength cream that works to seal cracks, replace lost oils, condition the skin and form a protective barrier to keep hands in top condition. Repairs dry, rough, cracked, irritated and calloused hands. Designed for active hands to keep them in top condition. It provides long-lasting protection from damage to hands caused by repeated washing, prolonged use of latex gloves, chemicals, solvents, glues, cleansers and contact with other allergens and irritants. 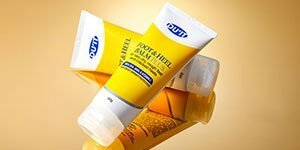 DU’IT Tough Hands is an advanced, multi-action treatment formula that contains skin smoothing natural lactic acid to exfoliate away dryness and improve skin texture and suppleness. UREA 10% Natural skin conditioner that maintains skin moisture balance and seals cracked skin. VITAMIN E Promotes skin healing, replenishes moisture, rehydrates dry and stressed hands. AHA’s Exfoliates and removes dead skin layers without the need for a pumice stone. DIMETHICONE Acts as a protective coating that shields skin with a non-greasy proactive barrier which counter-acts the loss of vital oils that leads to cracking and drying of skin. SODIUM PCA Intensive moisturiser that acts in synergy with UREA and holds moisture in the skin. LEMON MYRTLE and TEA TREE Anti-microbial agents used to treat minor cuts and mild infections. Aqua/Water, Urea, Lactic Acid, Cetearyl Alcohol, Cyclopentasiloxane, Natural Starch Derivative, Dimethicone, Ethylhexyl Palmitate, Glycerin, Glyceryl Stearate, Sorbitan Laurate, PEG-100 Stearate, Ceteareth-20, Myristyl Myristate, Sodium Lactate, Tocopheryl Acetate, Sodium PCA, PEG-20 Stearate, Silica, Lauryl Pyrrolidone, Piroctone Olamine, Backhousia Citriodora (Lemon Myrtle) Leaf Oil, Leptospermum Petersonii (Lemon Tea Tree) Oil, Disodium EDTA, Benzyl. Initially apply 2 or 3 times daily to clean, dry skin and at bedtime for 7 days then as necessary to maintain softer and younger looking hands. Designed for active hands to keep them in top condition. It provides long-lasting protection from damage to hands, caused by repeated washing, prolonged use of latex gloves, chemicals, solvents, glues, cleansers and contact with other allergens and irritants. DU’IT Tough Hands is an advanced, multi-action treatment formula that contains skin smoothing natural lactic acid to exfoliate away dryness and improve skin texture and suppleness. Proven to fix bad hands within 5 days. I have many hand creams that I have bought over the years and this is one of the best. 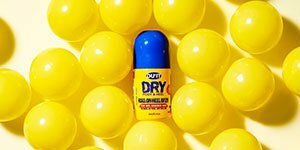 It applies immediately into my skin and has an oily feeling without being greasy or oily. It is a light clear/grey coloured cream. It also has a mild lemon scent which isn’t artificial or overpowering. I kept hearing that this was a good cream to try for rough and dry hands but I couldn’t find it anywhere. I bought a couple of tubes from an online chemist back then but nowadays I see it in more pharmacies and even grocery stores. It may have been odd stock but when I bough the 3 tubes, 2 tubes didn’t snap shut as the snap part on the flip top lid was lose. It made it a bit irritating to use but it may have been a bad batch of plastic. Once I apply this hand cream, my skin feels soft and all my rough cuticles and fingers are human again. My cuticles always dry and can scratch someone, so I use this cream on my cuticles and that has kept them in much better condition. For me, this hand cream stands out among other more expensive smaller sized creams because it makes my skin look and feel better and the results last longer. This is a wonderful hand cream that transforms dry and uncared for hands into luscious and moist hands in no time at all. It is luxurious, thick, but not greasy, very hydrating and moisturising, and really does make your hands feel cared for. Thank you for making this product. It is the best hand cream that I have ever used. Being a domestic cleaner my hands are constantly in contact with various cleaning solutions and in and out of water. Have been using Tough Hands for about a month, sometimes 4 or 5 times a day. The results are remarkable. No more chaffed hands or splits. Would recommend this product to anyone. Thanks again for having such a great product. Having developed painful eczema on my hands, I was really struggling. I was reluctant to rely heavily on steroid creams, but my hands were so painful, it had become a necessity. Even when my skin was flaring up, my hands were dry and prone to cracks. I also have sensitive skin, so the majority of creams cause even more irritation. I work in the corporate world and I used to dread meeting someone new and shaking their hands as they were so dry. I saw an advert of Tough Hands in a magazine and was drawn to the testimonials from people with similar conditions. 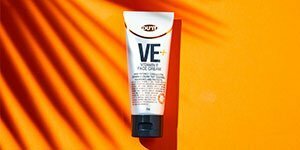 I absolutely love this cream and panicked when I realised I had forgotten to take the product on holiday. Fortunately I managed to get some at the airport! I wholeheartedly recommend this cream, not only for those with skin conditions, but for anyone with dry skin. I now see a lot of people in the gym using this product to save them from calluses, so it truly is multi purpose! Great product. My hands get very dry and crack and bleed in the winter. I started using this every night and they are much better. It’s the best hand cream! Does it’s job for very dry hands – At first glance the packaging looked kind of ugly so I wasn’t expecting much. It came out as a gel-lotion, and felt slightly tacky after application. This is a very heavy duty hand cream for really dry hands and forms a barrier on the skin. It made a good overnight hand treatment. One thing I was thrilled with was the ingredients list, as it’s pretty natural. All in all it does it’s job for very dry hands. A good hand cream for winter and those who have to wash their hands often. I ended up giving the rest to my mum as she’s a dentist who has to wash her hands hundreds of times per day. Wounderful product. Fingers were like sandapaper..now soft as after 5 days. Stays greasy for a while but worth the wait. What is the difference between Tough Hands and Tough Hands for Her? DU’IT Tough Hands for Her is scientifically formulated as a potent, hydrating hand moisturiser with anti-aging properties. Designed to guard against premature ageing, visibly brighten and condition skin, cuticles and nails and increase moisture levels with long-lasting hydration. Contains a powerful peptide blend that supports natural collagen and softens the appearance of fine lines and wrinkles, panthenol for firming and niacinamide for skin elasticity. Its non greasy protective barrier shields skin from harsh environmental stresses and neglect while locking in the skin moisture to keep skin highly hydrated. Are your DU’IT products vegan? DU’IT Skin Care upholds holistic principals but does not ascribe to a vegetarian or vegan philosophy. 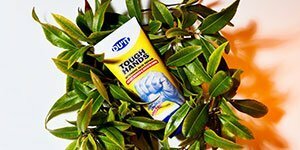 However Tough Hands does not contain animal or animal-derived ingredients. Our Glyceryl Stearate and Lactic Acid ingredients are derived from synthetic or plant extracts. Are your DU’IT products gluten free? No, as some of our products contain natural vitamin E ingredient. However if you have specific questions or concerns regarding gluten and the ingredients contained in our formulas we recommend you consult your physician. Designed for active hands to keep them in top condition. It provides long-lasting protection from damage to hands, caused by repeated washing, prolonged use of latex gloves, chemicals, solvents, glues, cleansers and contact with other allergens and irritants. DU'IT Tough Hands is an advanced, multi-action treatment formula that contains skin smoothing natural lactic acid to exfoliate away dryness and improve skin texture and suppleness. Proven to fix bad hands within 5 days. Does it's job for very dry hands - At first glance the packaging looked kind of ugly so I wasn't expecting much. It came out as a gel-lotion, and felt slightly tacky after application. This is a very heavy duty hand cream for really dry hands and forms a barrier on the skin. It made a good overnight hand treatment. One thing I was thrilled with was the ingredients list, as it's pretty natural. All in all it does it's job for very dry hands. A good hand cream for winter and those who have to wash their hands often. I ended up giving the rest to my mum as she's a dentist who has to wash her hands hundreds of times per day. Great product. My hands get very dry and crack and bleed in the winter. I started using this every night and they are much better. It's the best hand cream!